The transonic wind tunnel is a blowdown facility with a cross section of 6” wide by 22” high (0.15x0.56 m) and a test section length of 44” (1.12m), with optical access from the top and both sides. The settling chamber contains a perforated plate, honeycomb and eight screens (60-mesh) used to improve flow quality, resulting in a turbulence level of +/- 0.5%. Within the test section, perforated sidewalls with 1/8” holes (6% porosity) create isolated cavities for reducing Mach wave reflections, and a cam mechanism can articulate the test article at controlled frequencies up to 25 Hz. 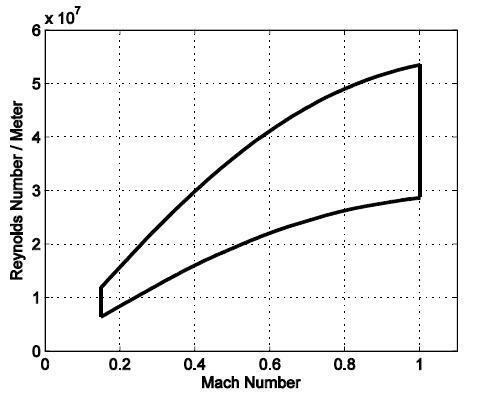 The Reynolds number and Mach number can be independently set according to test specifications. Reynolds numbers can range from 2 to 16 million per foot of chord, while a steady freestream Mach number can range from 0.18 to 1. In addition to steady freestream Mach numbers, the tunnel is capable of producing Mach number oscillations, independent or phase-locked to those of the test article, with an amplitude of 0.07. This facility has been used to examine an airfoil under isolated variations in Mach number and angle of attack. Recently, an investigation of coupled oscillations in Mach and angle of attack, simulating a helicopter in forward flight, has been conducted. Flow control of the test article has also been investigated using vortex generator jets (VGJs) and nanosecond pulsed Dielectric Barrier Discharge (NS-DBD) actuators.